Is Russia Losing Control over the Ukrainian Separatists? This is a guest post by Milos Popovic, a PhD student at the International Relations and European Studies Department at Central European University in Budapest, Hungary. 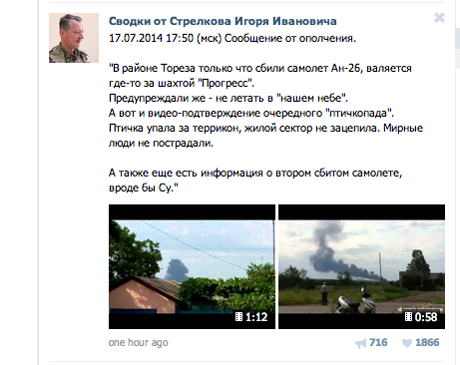 A recent post by a Russian-backed separatist leader Igor Girkin claiming credit for shooting down the Malaysian airline MH17 had circulated the Internet before it was removed. The separatists now deny their involvement arguing that they don’t have the capabilities to shoot down a plane at 10,000 meters (reportedly, the altitude of MH17). The evidence suggests that the plane was hit by the surface-to-air BUK missile system, which can launch missiles up to an altitude of 22,000 meters. Both the Russian and Ukrainian military have this hardware, but the two countries adamantly reject their involvement. Allegedly, a group of AP journalists have encountered a launcher similar to the BUK system near the town of Snizhne, which is under the rebel control. While Russia doesn’t deny its military support to the separatists, it denies the delivery of the BUK to its client. If it turns out that the Ukrainian rebels carried out the attack against Moscow’s directions, it will be a major source of embarrassment for Russia, their main supporter. However, it won’t be the first time that a proxy embarrassed its sponsor. For instance, the Palestinian leftist groups have abducted foreign tourists in the late 1960s against the interests of their Arab sponsors. The Abu Nidal Organization embarrassed Syria when it claimed the responsibility for IRA’s assassination attempt against the British Prime Minister Margaret Thatcher in the 1980s. During the Yugoslav wars, the Bosnian Serb leadership outraged their sponsor, Serbian President Slobodan Milosevic, when they refused to accept the Vance-Owen Plan. In Sri Lanka, the Tamil Tigers first refused a peace agreement brokered by their sponsor India, and then turn their guns against the Indian peacekeeping corps. In my PhD dissertation, I analyze such cases where rebels defect against their state sponsors and particularly when they defy, desert or turn guns against sponsors. Digging through the open sources, I identified more than one hundred examples of rebel defection among 108 movements in the period 1968-2012. More cases are probably buried in numerous secret files around the world. One of my findings is that coethnics are more likely to defect against their sponsors. Rather than preventing defection, ethnic ties fuel it: ceteris paribus, coethnics are 2.5 times more likely to defy orders than non-coethnics. Also, they are 4 times more prone to desert combat or turn guns against their sponsor than non-coethnics. Why are coethnics such disobedient proxies? A potential answer hints at the existence of popular support for rebels within the sponsor state. Popular support includes sympathies and material support from the political parties and nationalist organizations, the military, the businesspeople and the church. These organizations may expect an unwavering government backing of the rebels. Although a sponsor government may find this support costly, it often depends on these organizations for survival. In addition, if the regime plays a nationalist card by intervening on the side of the brethren, it may produce the rally-around-the-flag-effect. This effect can divert public attention from pressing political or economic issues and increase the popularity of the leader. A recent poll shows that public support of President Putin has hit the roof since the outbreak of the Ukrainian conflict. The rebels may assume that the popular support implies sponsor’s unconditional support for their actions. Riding the wave of nationalist fervor, the rebels may become more daring believing that the support will never cease. With this misperception at play, the coethnics may overestimate their sponsor’s patience and commit morally or materially damaging acts. While Russia may not face the Indian scenario, the recent tragedy may point to a potential defiance of orders. If it turns out that the Ukrainian separatists did shoot down the Malaysian civilian plane, and if they did it on purpose (and not mishandling information), it would be hard to believe that Russia approved of their action. Putin is too serious and cautious to support such a direct act of international terrorism. Neither is he interested in deepening tensions with the West and prolonging economic sanctions, despite his defiant tone. None of these promote Russian interests, but push the country deeper into isolation. But one thing is certain: by supporting the Ukrainian rebels the Putin regime risks losing the control over them. Losing control over the separatists may give birth to unintended consequences, and ultimately fully draw Russia into the war.